Hey guys, Dan Thomas from Image Doctor and Improvemant.com and watch the video above or read the article below to learn HOW TO TIE A WINDSOR KNOT. And there is another very important “MUST KNOW” for all men which is that in order to be able to present a strong, sharp and confident image all men must know HOW TO TIE A WINDSOR KNOT. The Windsor knot brings with it elegance, class, strength and confidence and will be the final piece when a man is putting together his style jigsaw puzzle to get the job, impress in the client meeting, get investment at his pitch, make a good impression when talking from stage or impress all the women in the room. 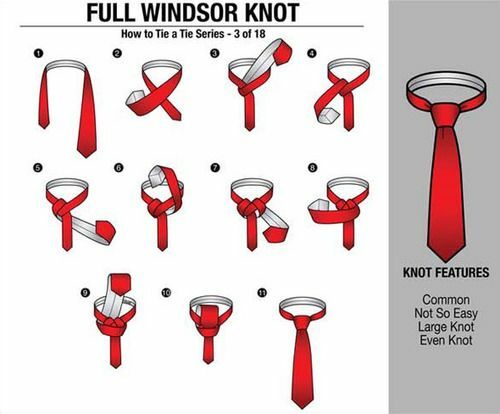 I have included both a detailed demonstration video above as well as an image below of HOW TO TIE A WINDSOR KNOT so use both these resources to learn this men’s must have skill and you will be one step closer to creating a strong image reputation among your peers. I hope this information was helpful for you and if you enjoyed the video and article, feel free to like, share and leave your comments down below and keep tuning back into Improvemant.com for regular videos to improve yourself as a man.